Due to SRK’s super success as a romantic hero, he had been criticised for over-using his immensely popular lover boy image. But if we take a closer look at the list of his last 10 movies, SRK has played a variety of character in almost every possible genre in Indian cinema; an arrogant bitter husband who cheats on his wife in ‘Kabhi Alvida Na Kehna’, Mafia King in ‘Don’ and ‘Don2’, Hockey coach in ‘Chak De India’, 70s struggling actor in ‘Om Shanti Om’, Introvert government servant in ‘Rab Ne Bana Di Jodi’, Autistic muslim in ‘My Name Is Khan’, a Superhero in ‘Ra.one’ and finally back to Rahul in ‘Chennai Express’. All characters are as different from each other as they can be. Note: Only movies that were Hit, Superhit, Blockbuser or All Time Blockbusters have been taken into consideration. Non-commercial or special appearances haven’t been included. Aamir Khan has not given a flop since ‘Mela’ in 2000. That means ‘Lagaan’, ‘Dil Chahta Hai’ and ‘Mangal Pandey’ added to his list of 6 consecutive hits and makes it 9 movies in a row without a flop. All of Salman’s 5 movies in the list have been huge blockbusters with ‘Dabangg’ becoming All Time Blockbuster. From December 2006 to December 2007, i.e. within one year only, Akshay Kumar delivered five consecutive hits in ‘Bhagam Bhaag’, ‘Namaste London’, ‘Heyy Babyy’, ‘Bhool Bhulaiya’ and ‘Welcome’. The next release ‘Tashan’ broke the streak as it turned out to be a Below Average grosser. But that was followed by a huge blockbuster ‘Singh Is Kinng’. Last but in no way the least, Amitabh Bachchan is the only actor till now who gave at least one hit every year for 14 consecutive years from 1972 (Bombay To Goa) to 1985 (Mard). Staggering feat! Ra.1 was a flop but somehow managed to get hit status…. And if you exclude Paheli and Swdes (one of the best film in B’wood ) then SRK has 17 Superhit/Blockbuster/ATBB to his credit from 2000-2013 . Billu was and marketed as SRK movie with more than 1 hours role and 4 songs, released in 2008-09. @Gewone, Paheli didn’t get Oscars attention, it was India’s official entry to the Oscars. Yes,srk is the most consistant actor. Wow! respect to All the “Khan”‘s! But Big B! Wow! you truly are brilliant! He is the most consistent actor in today’s Bollywood. Ladies and Gentlemen …..its King Khan for you…….now haters will say Billu was SRk movie and Ra-one was criticized how can that be a hit and all……..so just ignore coz deep down the heart even they know SRK has been THE most consistent and KING KHAN of Bollywood………. Indicine do u konw that Aamir deliver only one movie in a year whereas SRK dieliver two or three movies in a year which means Aamir is ahead of SRK in consistency. If Aamir Had delivered two or three movies in a year then Aamir would have been on the top. Mangal Pandey, Rang De Basanti, Fanaa, Taree Zameen Par, Ghajini 3 idiots and Talaash..
Paheli, KANK, Don, Chak de India, OSO, RNBdJ, My name is Khan, Ra.1, Don 2, JTHJ, CE.. IF I am not wrong Talaash is a semi-hit or above-avg…….a movie has to be either accepted if it collects low or should collect huge if it is rejected to be termed a HIT…Talaash did neither…….Ra-one was not accepted by EVERYBODY but collected huge…..hence it is SAFE………..
people who compare SRK and Salman should understand the fact that when it comes to consistency or making meaningful cinema or Filmfare Best Actor award or playing strong characters, Salman does not stand a chance but SRK on any given day can destroy BO records (which is Salman’s area)……..
Aamir and Salman cannot ignite passion, emotion, cannot impact you, are not emphatic, cannot polarize opimions. A star must be mercurial, sparkling, champion like SRK! Chennai Express is not a film,is not a feature..it is an answer..a slap..a claculated mathematical answer to silence the detractors! Salman fans, who’s your daddy now? 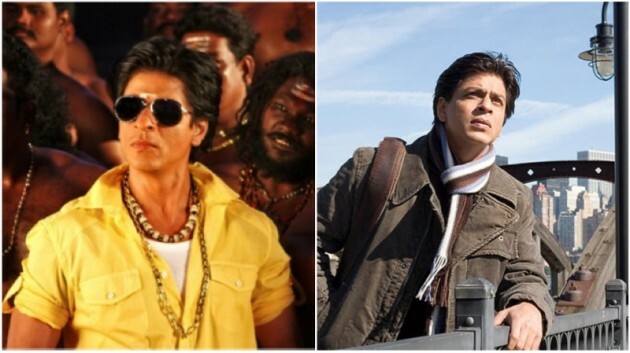 Shahrukh has been easily the most conistent actor over the years.. No doubt what so ever! And he has proved his versatility too by giving hits in every possible genre!